The Cappuccino Chronicles: A Novel - Workshops and Events with Pashmina P.
Twenty Seven Years after graduating from Shatin College, Pashmina was invited to participate in her very first TEDx presentation. She discussed how intuition has been her greatest teacher, and how a series of epiphanies actually came to fruition, when she learnt to listen to her gut. Pashmina's first epiphany was when her eldest daughter was born premature - 16 years ago - at 26 weeks, and weighing only 945 grams. At this fragile time in her life, Pashmina realised that trying to control her outside circumstances was not helping the little baby grow. When she began to let go, and trust in the power of something bigger than herself, a series of epiphanies hit her like a wave. Pashmina discussed her meeting with His Holiness The Dalai Lama, and how connecting with him was definitely written in the stars. stay tuned for the TEDx YouTube highlight launching next month. "Epiphanies come to fruition through intuition, and trusting in the power of the present moment." Pashmina P.
​On march 22nd 2019, Pashmina had the honour of meeting the 14th Dalai Lama. The trip to Dharmsala, India was a journey that Pashmina never thought would happen. The ripple effects of writing The Cappuccino Chronicles Trilogy, has led her to some very interesting places. By far, meeting with His Holiness has been the most memorable. She presented her book to His Holiness, and he looked at them and whispered her name. He then offered his blessings and reminded Pashmina to, "be good." The meeting has left Pashmina with an overwhelming feeling of gratitude and love. The spiritual pilgrimage led her to Hong Kong shortly after India, where she was invited to speak at a Tedx talk at her old high school. The theme was on epiphanies, which was an appropriate topic, especially after her beautiful encounter. Pashmina is so honoured to say that The Cappuccino Chronicles Trilogy is NOW in the hands of His Holiness The Dalai Lama. She's not sure if it can get better than that. Let's see what other epiphanies lay on the horizon for this author. 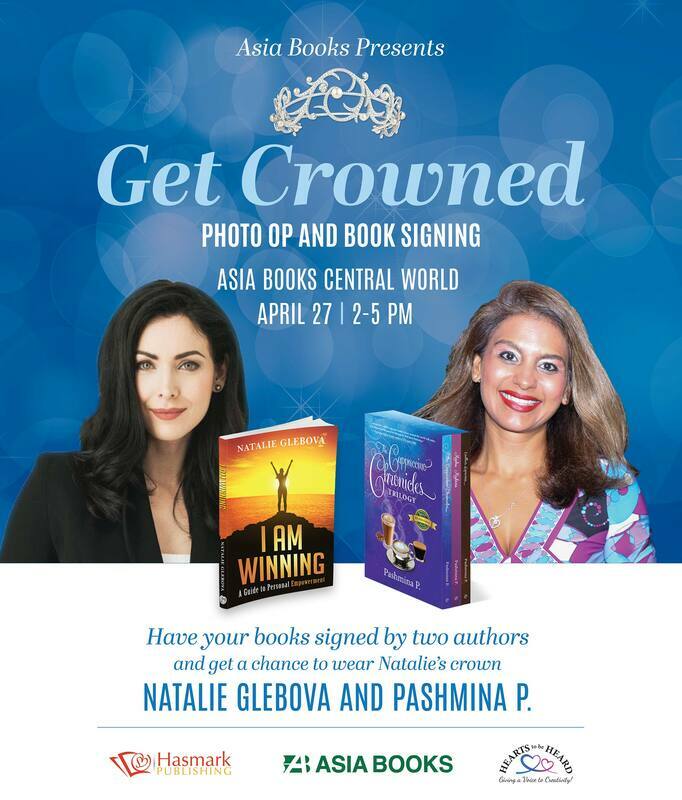 In celebration for Women's Day in Thailand, Pashmina collaborated with Natalie Gleobova, author of I Am Winning, A Guide to Personal Empowerment, and Talar Zambakijan from Be a Starlette. 30 women were showcased by a 'wall of pictures' to highlight the theme of uplifting each other up. Money was raised for The Good Shepard Home, for battered women. Pashmina was asked to speak on a panel where she discussed a time when she was bullied in her life by another woman. The theme of the day was to also provide some inspiration to other women at the event, reminding them that we are all in this together. Pashmina also discussed how an influential woman entrpenuer helped her to become brave in the workforce. Pashmina was grateful to be part of this event. You can also watch her on the Youtube link below from TNN Channel 16. In November 2018, Pashmina collaborated with Hearts to be Heard through a Children's Publishing Workshop in Thailand. Students, aged 8 to 15 from the community participated in this event. Pashmina's mission was to find a child artist to help her with her upcoming book, "What is a Gupsey." Launching in summer 2019. Two children from the workshop were shortlisted for the project and Ari Silva was chosen to be the artist. As an ambassador for Hearts to be Heard, Pashmina believes that children need a voice too. The onset of the collaboration stems for Pashmina's love for teaching. She is excited to host more of these workshops and looks forward to finding more talent in the near future. Children are our future and deserve to be heard. If anyone has a child who would be interested in getting published, please do not hesitate contact The Online Author's Office for more details. the team can't wait to hear from you. The Imperial, New Delhi hotel invited The Cappuccino Chronicles - International Best Seller to make an appearance at their LIBRARY. After a successful first round in India at the World Sufi Music Festival in Jodhpur, Pashmina was asked to leave 2 copies of The Cappuccino Chronicles and Mocha Madness at the Imperial Hotel in New Delhi. This served as a way to resurface in India again through one of the oldest heritage hotels in India. The service, management, decor of the hotel and the library was a serene and calm place for Pashmina to reflect on her writing journey. "Thank you. Namaste INDIA, and enjoy the read." As part of Pashmina's quest to find the perfect sanctuary for writer's to unwind, two individuals who own, Merchant House, have invited her to host a 10 day writer's retreat in Sri Lanka in January / February 2019. Author's will get to experience the tranquility and serenity of living and being pampered in a villa for 10 days. Tours around Sri Lanka, a safari, turtle hatcheries, massages, excellent home cooked meals from the private kitchen, and yoga was the perfect escape for Pashmina when she visited in August. A 4 bedroom villa holds the magical qualities for an intimate 10 day writing workshop, with an additional workshop host and guest author. Participants will experience writing in a peaceful environment while honing in on their creativity. The annual Galle Literary Festival will be hosted during the time of the retreat. Tickets for selected events will be provided for author's to take a walk around Galle Fort and experience art, literature and culture. Some reputable names in the literary world have visited the festival in the past. Calmness and being in direct contact to nature gave Pashmina, the author, a chance to unwind, relax and release her writer's block for her next upcoming book "Am I the One," which is scheduled for launch early next year. After writing The Cappuccino Chronicles trilogy, Pashmina knew that the flow of writing was locked inside her. The trip to Sri Lanka provided a space as well as healing which opened the doors to creativity, strength and an abundance of ideas. Participants who are interested in our retreat, please contact Pashmina on her email. pashmina.p.writer@gmail.com for further enquiries. This retreat is an exclusive experience full of adventure, calmness and information. Writers will get to experience the beauty of Sri Lanka while attending daily 3 hour writing, editing, design and storyboard workshops every morning after breakfast. Meals and accommodation as well as a Dawn Safari Tour will be provided, along with yoga, massages and tickets to selected events at the literary festival. Pashmina also took her family to a Special Needs School in Matara Village to give back to the community who refreshed her senses. Gratitude and Service definitely go hand in hand! Sri Lanka, known as "The Holy Land," served its purpose for an international best seller, as well as an author whose budding creativity was allowed to bloom. Don't miss out on our retreat coming up next year. The path to success is never straight, but it can undeniably be as colourful as we choose. Pashmina recently visited her old high school, Shatin College, to present a workshop to the year 10 students about mindset, goal setting and the power of positive thinking. At her old school, she reminded students that it is okay to fail, because through failure we grow. Dusting ourselves off and getting back up and moving forward was the theme of her workshop. Pashmina also made her rounds to Bookazine Hong Kong, where a book signing for Endless Espresso's was discussed and in the pipe line for this year. Along with visiting her old high school, Pashmina met up with her old boss Joanna Hotung of the KG Group and Shatin Junior School to discuss the possibility of joining hands to help children publish books. The brainchild of this was from Pashmina's publisher to be the Asian liaison, when her publisher's grand daughter published a book at nine years old. This endeavour is in collaboration with the Literary Fairies. Stay tuned for more and look out for Endless Espresso's coming soon. ​Pashmina recently visited several parts of beautiful India including Jodphur, the "Blue City," as part of The Cappuccino Chronicles: Mocha Madness book launch tour. Along the way, she met with the lovely Maharani (Queen) of Jodphur for a book signing, as well as several wonderful locals eager for a taste of Mocha Madness as they helped her embrace the richness of the region. Pashmina and The Cappuccino Chronicles team want to thank everyone for their welcoming hospitality, and look forward to returning to this beautiful sanctuary of culture and history soon!